This post War built semi detached is situated in a quiet residential area of Petts Wood on the Crofton borders, convenient for reputable Darrick Wood and Crofton schools, Petts Wood mainline station plus nearby shops and transport links in Crofton Lane. Serving Orpington and Bromley amenities. 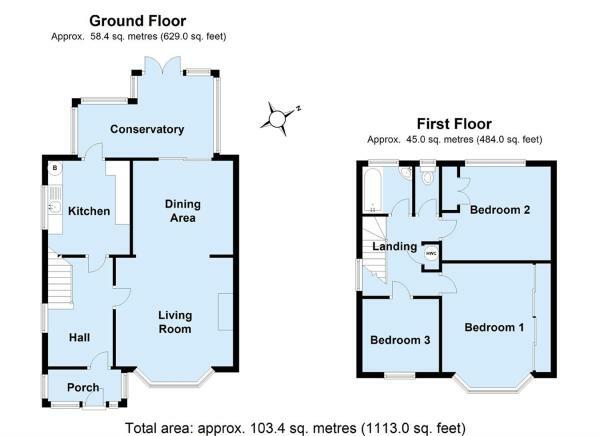 The property comprises three bedrooms, a through lounge/diner leading to a double glazed conservatory, contemporary kitchen and family bathroom with separate W.C upstairs. Outside you will note an attractive south facing rear garden backing on to Sparrow Wood, a sizeable detached garage via shared drive and private frontage for two cars. Additional benefits; include NO ONWARD CHAIN for the purchaser, double glazing, gas central heating, well presented interior and double glazed storm porch for that added family convenience and potential for a rear open plan extension and loft conversion to mirror neighbouring properties (subject to L A planning permission). For further information please contact the Sole Agents for a viewing. Petts Wood or Orpington office. Double glazed door and double glazed windows to front and side, porch light. Double glazed leaded light front door, radiator, understairs cupboard housing gas and electric meters, double glazed window to side. 3.65m x 3.95m (12' 0" x 13' 0") Double glazed bay leaded light windows to front, radiator, feature fireplace with gas fire, opening to dining room. 10' 10" x 10' 6" (3.30m x 3.20m) Double glazed sliding doors leading to conservatory, radiator. 10' 6" x 8' 7" (3.21m x 2.62m) Double glazed window to side, range of Shaker cream wall and base units, wall mounted combination boiler, built in fridge, plumbing for washing machine, wood effect flooring, recessed ceiling lights, space for cooker, part tiled walls, stainless steel sink unit with mixer tap, glazed door to conservatory. 5.00m x 2.95m (16' 5" x 9' 8") (At widest point) Double glazed French doors leading to garden, double glazed windows to rear and side elevation, tiled flooring. Double glazed window to side, loft access, built in airing cupboard housing hot water cylinder. 14' x 9' 9" (4.27m x 2.96m) (Up to wardrobe) Double glazed leaded light window to front, built in wardrobe, radiator. 11' 6" x 10' 6" (3.51m x 3.21m) Double glazed window to rear, built in wardrobe, radiator. 2.45m x 2.44m (8' 0" x 8' 0") Double glazed window to front, radiator. Double glazed window to rear, bath with electric shower unit & shower screen, corner sink set in vanity unit, heated towel rail. Double glazed window to rear, low level WC. An attractive south facing garden with generous patio, lawn area, established shrubs, trees and borders, outside tap, new garden shed, gate to rear with access to Sparrow Wood and a short cut pathway leading to Petts Wood and Crofton schools, side access gate leading to driveway, small stream towards end of garden. Detached garage with up and over door, power and light, side door. Private frontage for two cars, shared driveway to garage. Disclaimer - Property reference 14318917. The information displayed about this property comprises a property advertisement. Rightmove.co.uk makes no warranty as to the accuracy or completeness of the advertisement or any linked or associated information, and Rightmove has no control over the content. This property advertisement does not constitute property particulars. The information is provided and maintained by Proctors, Petts Wood. Please contact the selling agent or developer directly to obtain any information which may be available under the terms of The Energy Performance of Buildings (Certificates and Inspections) (England and Wales) Regulations 2007 or the Home Report if in relation to a residential property in Scotland.